Lasagna is always a family favorite, but that doesn't mean it needs to be cooked the exact same way every time. As in the recipe that follows, you get to swap out the beef for chicken or exchange the tomato sauce for white sauce and add in all kinds of vegetables. Spinach works particularly well. As with all lasagnas, the entire thing gets smothered in cheese for a rich and decadent dish that's not like your mother's lasagna! Because this dish uses cooked chicken, it's also a great way to use up leftovers. Just pull together a few other pastry staples and you'll be well on your way. 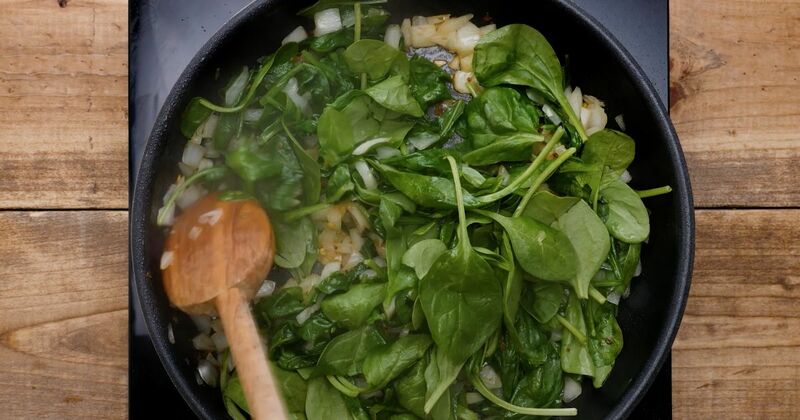 In addition to spinach, use other vegetables like zucchini or mushrooms -- to make it even more different, substitute cooked sausage for the chicken. While everyone has their own vision of what lasagna should be, this recipe proves that you really can take it whatever way you want it to go! Preheat oven to 375 degrees Fahrenheit and grease a 9" x 13" casserole dish. Heat oil in a large skillet set over medium-high heat. When oil is hot, add onion, 1/2 teaspoon salt, thyme, and red chili flakes. Saute for about 3 minutes. Add spinach, in batches if necessary, and cook for about 1 minute until it just begins to wilt. Remove pan from heat and stir in cooked chicken. Heat chicken stock over medium-high heat until it boils. Lower heat to a simmer. Combine milk, flour, and nutmeg. Whisk until smooth. Gradually add the milk mixture to the hot stock on the stove, whisking as you do to prevent lumps from forming. Stir in remaining 1/2 teaspoon of salt, and simmer the milk and stock mixture for 5 minutes or until thickened slightly. Remove saucepan from heat and stir in Parmesan cheese. Pour 1 cup of the sauce into the bottom of prepared casserole dish. Spread 3 or 4 lasagna noodles over sauce, then top with 1 1/2 cups chicken mixture. Add another 3/4 cup of sauce and 1/4 cup of the mozzarella cheese. 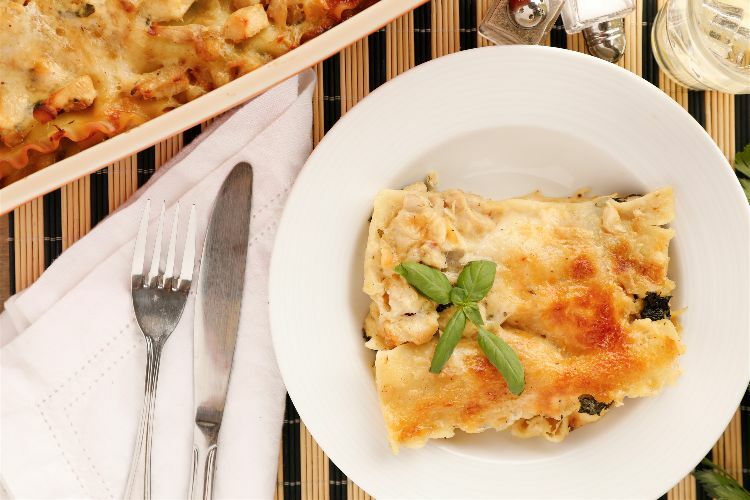 Repeat layers until all ingredients are used, ending with lasagna noodles topped with 1/4 cup of sauce and the remaining 3/4 cup of mozzarella. Cover the lasagna with foil and place in oven for 40 minutes. Remove foil and bake for another 15 to 20 minutes, until cheese is browned and lasagna is heated throughout.